Item #N168374 - Clear Crystal Rhinestone Goldtone Vintage Estate Antique Rose Link Necklace - A Book Piece! Item #N168416 - Pastel Smokey Crystal Vintage Estate Victorian Style Coil Necklace. Double layers glistening pastel smokey graduated crystals encircle the neck base with three soft crystal draped chains frame a charming glitzy crystal teardrop. Also, two dangling crystal faceted beads on each end add movement and allure. Exquisite design that has an antiquity Victorian appeal. The front drape portion is 3 1/2" wide and drapes to a 3" length. Excellent condition. A fabulous necklace to wear at weddings, prom nights, pageants, parties, cruises and special functions! US$148.00. 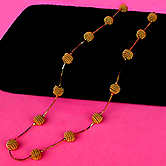 Item #N168385 - Signed Trifari Goldtone Wired Ball Vintage Estate Necklace. Designer: Signed TRIFARI TM. The company is founded around 1918 as Trifari and Krussman later in 1920's Carl Fishel joins company and becomes Trifari Krussman and Fishel. The mark TRIFARI TM dates this beautiful Trifari wired ball necklace to the late 70's era. It is still in near mint condition and has a 24" shimmering generous length to show off. The 8mm (almost 1/2") goldtone wired round balls exhibit noticeable wonderful texture which contrast the smooth, high-polish gleaming goldtone accent beads on each side beautifully. Needless to say, very well-made. Classy, beauty and elegance all roll in one for almost any occasion and attire. Near mint condition. A fabulous necklace to wear at weddings, prom nights, pageants, parties, cruises and special functions! US$128.00. 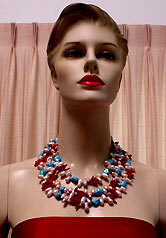 Item #N168359 - Three Strand Genuine Baroque Pearl Blue Turquoise Red Coral Beaded Bib Necklace. Three glorious strands of lustrous chunky genuine baroque pearls, pacific blue turquoise and lipstick red coral branch beads fashioned into a showy wide bib in striking color contrast to demand attention! Baroque pearls measure almost 1/2" each, red coral branch beads and blue turquoise beads are over 5/8" each! 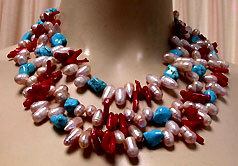 All genuine pearls, turquoise and coral beads, wow! Mint condition. A fabulous necklace to wear at weddings, prom nights, pageants, parties, cruises and special functions! US$298.00. Item #N168439 - Antique Jet Glass Bead Vintage Estate Long Necklace. Not only is this jet glass bead Antique Necklace beautiful, it is also versatile. 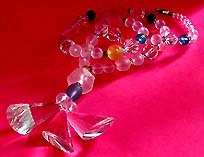 It is almost 5 feet long and has a total of 137 jet glass faceted 8mm beads individually hand knotted in between each bead. It is sturdy and appliable so that you can wear it in different ways. Please see the large photos. This antique necklace is from the flapper era when long necklaces were most popular. You'll derive years of fun and enjoyment from it. Excellent condition. A fabulous necklace to wear at weddings, prom nights, pageants, parties, cruises and special functions! US$168.00. 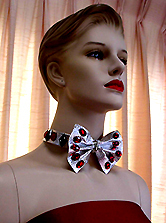 Item #N168442 - Las Vegas Show Girl Faux Leather Rhinestone Vintage Estate Bow Tie Collar Necklace. Are you ready for some serious partying?! 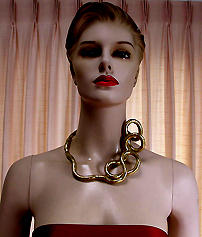 This Las Vegas Show Girl vintage collar necklace will just do it! Textured shiny silver faux leather collar, big bow tie, decorated with large oval sparkling ruby red and diamond shaped sapphire blue rhinestones. The bow tie measures 5" x 4", ruby red rhinestones 1/2" each, sapphire blue rhinestones 1" each! Wow! Excellent condition. A fabulous necklace to wear at weddings, prom nights, pageants, parties, cruises and special functions! US$88.00. 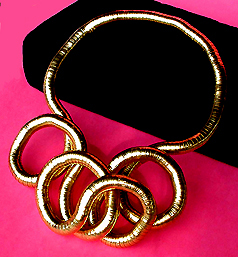 Item #N168389 - Innovative Versatile Bendable Goldtone Necklace. 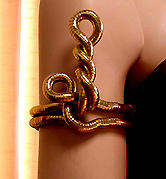 The bendable metal when bent to a desired configuration stays in that configuration until it is changed by the wearer. It has a high fatique life and doesn't break from bending, twisting, turning or molding. 3/8" thick shiny metal magically transformed into beautiful bold curves and sumptuous layering by easily twisting and bending the metal. Create unlimited unique gorgeous designs instantly, as many styles as your heart's desire, from futuristic abstract to timeless classics that are only found in high-end specialty celebrity boutiques or on the glossy pages of high-fashion magazines. Just one price will give you endless upscale designs to spice up your wardrobe as if you have spent thousands. Necklace has no clasp so can be bent and mold around the wrist or upper arm to wear as a bracelet as well. Fun, bold, high-end, innovative and versatile. No instruction necesary. You need not be artistically inclined to enjoy this piece! Also available in silver color. Mint Condition! A fabulous necklace to wear at weddings, prom nights, pageants, parties, cruises and special functions! Offered at low introductory price. US$98.00. Item #N168325 - Sky Blue Crystal Gilt Brass Filigree Beaded Vintage Estate Antique Necklace. Size: Length: 17 1/2" including the 4" extender. Beautiful graduated strand necklace comprised of sparkling sky blue crystals, diamond shaped crystal spacers, alternating the gorgeous Haskell-like gilt brass filigree balls! The gorgeous extender has ornately edged gilt brass links and a gilt brass filigree ball tipping the end. The largest blue crystals measure generously at 1/2" and the largest filigree ball measures 5/8"! The crystals have intense clarity and sparkle like the shimmering blue Hawaiian ocean! Excellent condition. Exquisite! A fabulous necklace to wear at weddings, prom nights, pageants, parties, cruises and special functions! US$128.00. SOLD. Item #N168417 - Frosted White Art Glass Bead Vintage Estate Antique Necklace. Frosted ice luminous white art glass hand cut into large teardrops to create a radiant appeal. The frosted white art glass round beads are also hand cut and polished for an ultra lustrous shine. 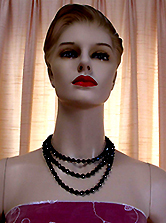 Neck chain has shimmering glitzy clear glass seed beads leading to an old style silvertone barrel clasp. Each teardrop measures boldly at 1 3/8" x 3/4" and 1/4" thick. The art glass smooth round beads eachs measures 3/8". Absolutely gorgeous! Excellent condition. A very special piece. A fabulous necklace to wear at weddings, prom nights, pageants, parties, cruises and special functions! US$138.00. Item #N168317 - Signed Dauplaise Frosted Pastel Lucite Crystal Vintage Estate Antique Designer Necklace. Designer: Signed DAUPLAISE. Marked Patent 3427691 on the clasp. Carol Dauplasie joined Haskell in '59 and for over 20 years was in charge of the showroom. She started her own line in the 1980's. This sensational signed Dauplaise designer vintage necklace features large, chunky frosted and clear lucite beads in gorgeous pastel colors! It has a beautiful 4" drop with 3 huge dazzling clear lucite prisms (each measuring 1 3/4" x 1") to command attention. The generous 30" length can be worn as a belt if so inclined. It closes with a patented clasp which was invented by James R. Johnson in early 1969. To those who are not familiar with lucite jewelry, lucite was developed in the late 1920's and was brought to market in the early 1930's by Rohm and Haas Company. Lucite was widely used as an alternative to glass at the time as it is strong and shatter resistant. This unique Dauplaise designer necklace is not only beautiful but collectible as well. Excellent condition. A fabulous necklace to wear at weddings, prom nights, pageants, parties, cruises and special functions! US$188.00. 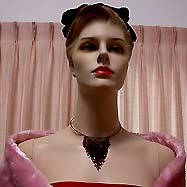 Item #N168281 - Art Deco Ruby Red Iridescent Vintage Estate Antique Necklace. Size: Length: Memory wiring fits any adult necks". The stunning Art Deco drop (2 1/4" x 3 3/4") has countless beautiful iridescent ruby red glass beaded short strands layering over one another creating voluptuous volume. The exquisite drop is ultra soft and drapy. It cascades effortlessly with shimmering iridescence throwing off vivid hues of passionate red sparkles. The glistening red glass beaded neck strand circles the neck with comfort and gorgeous shimmer. Sensational! Excellent condition. A fabulous necklace to wear at weddings, prom nights, pageants, parties, cruises and special functions! US$168.00. Item #N168202 - Early Unsigned Mariam Haskell Antique Sautoir Necklace With Faux Pearl Crystal Tassels. Flaw: A bit of coat loss on a few faux pearls of the strands. Not noticeable at all. Designer: UNSIGNED. Miriam Haskell made high end jewelry since 20's. Her costume jewelry is the collectible of the collectibles. Most of her pieces were signed from the 1940's onward. This is a beautiful and rare early unsigned Haskell estate piece! The sautoir necklace is a very sturdy antique goldtone chain with a richly embellished faux pearl tassel hanging from each end! For those who are sure what a sautoir is, it is a long necklace with an ornament at each end, typical a tassel or a pendant. Sautoirs were made in the early 1900's. 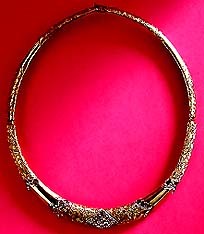 This fabulous sautoir necklace is one of Haskell's very early creations. The exquisite tassel has the elaborate Haskell craftmanship and the high-quality material of antique glass faux pearls, clear brilliant paste stones and gilded brass. Miriam Haskell is known for using fine quality material imported from France, Italy and Venice with most crystals came from Bohemia. All her pieces are done by hand and has the distinct characteristics of irregularities in her pieces. The top of the tassel is a gilded brass filigree dome that has a large glass faux pearl at the summit surrounded by precious tiny seed pearls. It is further adorned by channel set brilliant clear paste stones and a filigree gilded brass wall from which 8 glorious strands of shimmering faux pearls are hang! Also note the large lustrous 1/2" glass faux pearl embrassed from within the gorgeous dome! Typical of Haskell pearls, they have a wonderful silver cast to them exuding that extra shine. The exquisite dome is 1" wide and the total length of the awesome tassel measures 3". The fabulous tassels hang like a priceless chandelier from a large domed ceiling of an ancient castle in a far away land. Aside from a bit of coat loss on a few faux pearls of the strands (not noticeable at all), this rare Haskell treasure is in excellent condition. You wear it like a scarf so you can create any styles and adjust the length to suit the neckline. You can also wear it as a belt if you're so inclined. A versatile, beautiful, rare antique estate Miriam Haskell piece to add to your Haskell collection! Excellent condition. A fabulous necklace to wear at weddings, prom nights, pageants, parties, cruises and special functions! US$428.00. 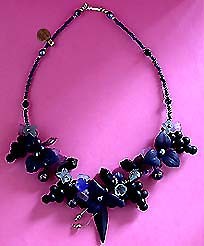 Item #N168179 - Lucite Violet Purple Cluster Lilac Vintage Bib Necklace. This fantastic lucite Vintage Estate Antique Necklace is handmade. It is strung with gorgeous irredescent gleaming purplish beads and has an awesome center cluster of grapes, lucite daisies, lilac, leaves, elongated prisms and art glass beads of various shades of blue, pink and purple! The very attractive and eye-catching cluster measures almost 8" wide and 2 1/2" in length and adorn the entire base of the neck. It has never been worn and still has the paper tag attached to it. The tag says "Handmade in Cambridge England". Near mint condition. A fabulous necklace to wear at weddings, prom nights, pageants, parties, cruises and special functions! US$128.00. Item #N168190 - Clear Rhinestone Goldtone Art Deco Inspired Vintage Estate Antique Necklace. This lovely necklace has 3 sections and are connected together by hinges. The beautiful necklace features polished and textured goldtone finish with glitzy clear rhinestone accent! The shimmering edged golden texture and the bright high polished goldtone contrast beautifully against one another. The outstanding Art Deco inspired necklace frames wonderfully around the neck. Excellent condition. It closes with a foldover clasp. A fabulous necklace to wear at weddings, prom nights, pageants, parties, cruises and special functions! US$128.00. Item #N168172 - White Faux Pearl Grape Cluster Mesh Goldtone Vintage Estate Antique Necklace. Size: Necklace - length 15 1/2". Beautiful timeless elegance! 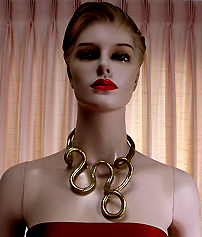 A classy and high-end designer Vintage Estate Antique Necklace. Dangling invitingly from the loop of a shimmering 3/8" wide textured soft mesh goldtone band is a beautiful 2" cluster of luxuriant white faux pearls. The soft mesh goldtone band lays alluringly on the skin and closes with an insert clasp for neatness and uniformity. 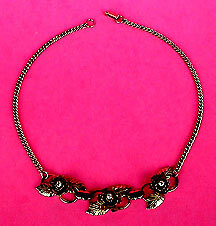 Gorgeous Vintage Estate Antique Necklace for almost any attire and occasions. Mint condition. A fabulous necklace also to wear at weddings, prom nights, pageants, parties, cruises and special functions! US$128.00. Item #N168167 - Signed Miriam Haskell Art Deco White Glass And Plastic Beaded Vintage Estate Antique Necklace. Designer: Signed MIRIAM HASKELL on the clasp and the hanging brass oval tag. Miriam Haskell made high end jewelry since 20's. Her costume jewelry is the collectible of the collectibles. Most of her pieces were signed from the 1940's onward. This pretty Miriam Haskell white Art Deco designer necklace is really interesting. 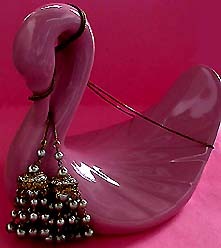 It is strung with glossy white glass round beads and has small white glass beaded spacers. 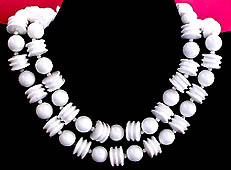 In between these glass beads are Art Deco barrel shaped plastic beads and a large twisted style white bead in the center. The white glass round beads measure 1/2" in diameter. The Art Deco barrel shaped plastic beads measure 3/8" x 1/2" and the large twisted style center bead is 1" x 3/4". A wonderful Miriam Haskell beaded necklace to add to your collection. Excellent condition. A fabulous necklace to wear at weddings, prom nights, pageants, parties, cruises and special functions! US$188.00.